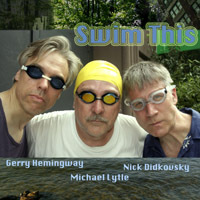 Swim This is a trio that spontaneously generates a world of intensely focused and evocative improvised music. The group creates a visceral and deep listening experience where no moment is lost, and each sound is projected with maximum momentum and razor sharp clarity. Swim This began with the initiative of Michael Lytle, who invited Didkovsky and Hemingway to perform at The Experimental Intermedia Foundation in 2006. The evening's extraordinary performance was recorded with meticulous care by James Carozza, and later mixed and produced by Didkovsky at Punos Music Studios. The result is a new CD entitled 'Swim This' (Punos Music, PM0006). An odd new trio featuring Nick Didkovsky on tabletop guitar & homebrew software, Michael Lytle on bass & contrabass clarinets & tapes and Gerry Hemingway on drums, voice w/ processing. Both Nick and Michael are longtime members of Dr. Nerve, although you might also recall Mr. Lytle as an original member of the downtown scene when he had albums with George Cartwright. In recent years, Nick has become more known as a composer, as a seasoned improviser with Paul Rogers & Kevin Norton. Gerry Hemingway is one of the distinctive percussionists, composers and bandleaders and should be well-known to fans of Braxton, BassDrumBone and that trio great with Georg Graewe & Ernst Reijseger. This disc was recorded live at a performance at Experimental Intermedia in March of 2006. 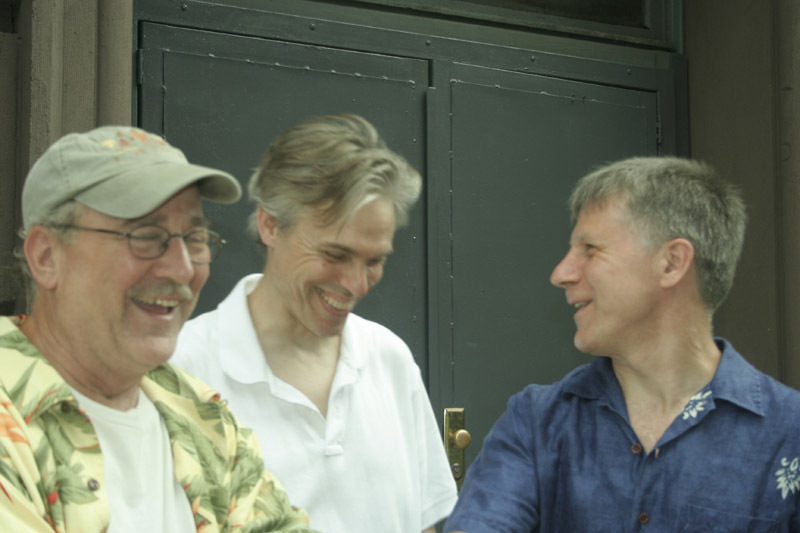 Three highly inventive improvisers (or instant composers) matching wits and working most creatively together. Featured here are two long (30+ minute) pieces that begin slowly and take their time to explore unique terrain. Squeaking bass clarinet, subtle electronics and small percussion sounds swirl freely together. That growling contrabass clarinet, eerie tapped guitar sounds and subtle hands-on-drums textures all add up to a strange, other-worldly undertow that pulls us into the murky waters. I like the way the trio work their way into segments that sound planned when they all connect into one streamlined force. What sounds just right here is that the bass clarinet squawks work so well with the subtle electronics or guitar textures and well-selected percussive sounds. A rich and varied improv date that doesn't always sound improvised. Nick Didkovsky is a guitarist, composer, and music software programmer. He founded the rock band Doctor Nerve in 1983 (www.doctornerve.org) and was a member of the Fred Frith Guitar Quartet during its 10 year tenure, contributing numerous pieces to the quartet. He has composed for Bang On A Can All-Stars, Meridian Arts Ensemble, ETHEL, Loadbang, ARTE Quartett, and others. His compositions and guitar work appear on over 50 records. With computer music pioneer Phil Burk, Didkovsky created the music programming language Java Music Specification Language (JMSL), which is used by composers all over the world (www.algomusic.com). He has taught JMSL at Dartmouth College, CalArts, Columbia University, and New York University. His Black Sabbath Guitar Lessons on YouTube have been received with great enthusiasm by metal fans all over the world (www.didkovsky.com/tabs). His metal band Häßliche Luftmasken had its premiere performance in June 2011. Gerry Hemingway has been making a living as a composer and performer of solo and ensemble music since 1974. He has led a number of quartet & quintets since the mid 80's including his current quintet with Ellery Eskelin, Oscar Noriega, Terrence McManus and Kermit Driscoll as well collaborative groups with Mark Helias & Ray Anderson (BassDrumBone) celebrating its 35th anniversary in 2012, w/Reggie Workman and Miya Masaoka on koto (Brew), Georg Graewe & Ernst Reijseger, recently celebrating its twentieth anniversary (GRH trio), WHO trio with Swiss pianist, Michel Wintsch and bassist, Baenz Oester, as well as numerous duo projects with Thomas Lehn, John Butcher, Ellery Eskelin, Marilyn Crispell, Terrence McManus and Jin Hi Kim. His collaborations with improvisers and composers include Evan Parker, Cecil Taylor, Mark Dresser, Anthony Davis, George Lewis, Derek Bailey, Leo Smith, Oliver Lake, Kenny Wheeler, Frank Gratkowski, Michael Moore and many others. His musical history, collaborations, performances and recordings are all documented on his website:http://www.gerryhemingway.com/. He currently lives in Switzerland having joined the faculty of the Hochschule Luzern in 2009.